The secret to a perfect fit & a warm, happy whippet is to measure & weigh your whippet correctly. We love what we do for whippets & pride ourselves with the best fitting & quality whippets coats in the world, to ensure your whippet is comfortable. Don't guess, or think that’s close enough, as your whippet's coat won't fit. Refer to the 3 inch rule of waist to back length explained below. Weigh your whippet. Don't guess. This is really important! Our coat sizes are primarily based on weight, then back length, with the waist used as a guide you have measured correctly. If you don't have scales, you can pass any vet & weigh your whippet at no charge, or call your vet for a recent weight from a consult. 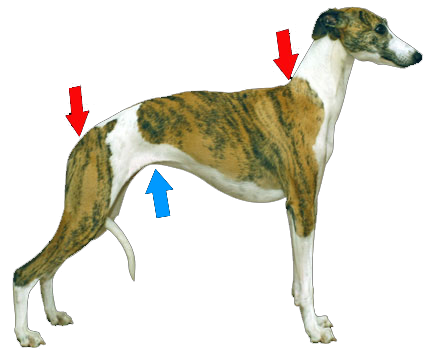 As shown in the diagram above, with your whippets head up, measure where the neck joins the body & makes a definite "corner", then run a cloth measuring tape down the spine to where the tail just starts. Do not measure any neck, only back length. Please do not add any back length as this will result in too large a coat size. The back length will be 3-3.5 inches more than the waist. Please refer to the red arrows on the diagram. Please measure in inches for accuracy as it's easier to see. Measure the smallest part of the waist. Our chest pieces secure over the last rib, not the waist, however we need the waist measurement to assess your whippet's size as we use a formula of length, waist, weight, & body condition. A whippet in healthy condition will have a waist 3-3.5 inches less than their back length. Please refer to the blue arrow on the diagram. Take all measurement three times, yes that's right, three times, to ensure you get the right measurements! Whippets are a tricky dog to measure, we know!. This is essential to a perfect fitting coat. If your whippet is 8 months old we can fit an adult size coat with room to grow. Provide only their current measurements as we will factor in the approximate growth percentage based on their age. Please refer to our PUP coat page for pups under 8 months & 11 kilos or KISS coat for larger pups.